When the pilgrimage season of 9 A.H. arrived, Muhammad, the Messenger of Allah, sent Abu Bakr as commander of the pilgrims to Mecca, he himself being too occupied with public and domestic concerns to absent himself from Medina. Abu Bakr and the pilgrims left Medina. A day after their departure, the Prophet received from Heaven a new revelation called Bara’ah or Al-Tawbah (The Immunity or Repentence) – the ninth chapter of Qur’an, and he was specifically ordered to promulgate it in Mecca either personally or to delegate authority to do so to someone from his own family, but to no one else. When someone expressed the wish that he should send it to Abu Bakr, Muhammad replied: "No one shall transmit it from me but a man of my own house." In compliance with this commandment of Heaven, Muhammad summoned his son-in-law and devoted disciple, Ali, and mounting him on the swiftest of his camels, urged him to hasten with all speed to Mecca, there to promulgate before the multitude of pilgrims assembled from all parts, an important sura of the Holy Qur'an, which he just received from heaven. Then he said to Ali: "Take this section from the beginning of Al-Tawbah, and proclaim it to the people on the day of sacrifice when they assemble at Mina." Ali executed his mission with his accustomed zeal and fidelity. Towards the close of the pilgrimage, on the great day of sacrifice, at the place of casting stones near Mina, Ali read aloud to the multitudes who crowded round him in the narrow pass, the heavenly command. He rose and announced himself a messenger from the Prophet, bearing an important revelation. He then read the sura of which he was the bearer; in which the religion of the sword was declared in all its rigor. After Ali finished his recitation of the Qur'an, he continued in his own words: "O men, no unbeliever will enter Paradise; no polytheist will perform pilgrimage after this year; and no naked person will be allowed to circumambulate the Kaaba. Whoever has entered into a covenant with the Prophet of Allah – may Allah's peace and blessings be upon him – will have his covenant fulfilled as long as its term lasts." Ali proclaimed these four instructions to the people and then gave everybody four months of general peace and amnesty during which anyone could return safely home. From that time on, no idolater performed the pilgrimage and no naked person made the circuits of the Kaaba. From that day on, the Islamic State was established. When Abu Bakr and Ali returned to Medina, the former expressed surprise and dissatisfaction that he had not been made the promulgator of so important a revelation, as it seemed to be connected with his recent mission, but he was pacified by the assurance that all new revelations must be announced by the Prophet himself, or by some one of his immediate family. 4. Instructing them in new knowledge. First to be mentioned among all the prophetic duties, is rehearsing the Signs of Allah. It is so important that it takes precedence over all other duties of the Prophet. It was this duty – Rehearsing the Signs of Allah – that Ali ibn Abi Talib was called upon to discharge. In 8 A.H. (A.D. 630) at the conquest of Mecca, Ali and his master, Muhammad, had purified the House of Allah (Kaaba) from the idols of the Arabs. Ali had broken those idols and had thrown them out of the Kaaba. In 9 A.H. (A.D. 631), he purified the Kaaba from the idolaters themselves by announcing to them that they would not be admitted into its sacred precincts ever again. Allah selected Ali ibn Abi Talib to restore His House (Kaaba) to the state of its pristine purity. Ali, the slave of Allah, restored that Exalted and Blessed House to the same state in which the Prophets, Ibrahim and Ismail (A.S.), had left it many centuries earlier. 1. 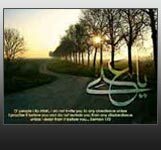 Ali ibn Abi Talib is a member of the family of Muhammad, the Messenger of Allah. 2. The duties of Muhammad, the Messenger of Allah, can be performed, in his absence, only by Ali, and by no one else. 3. A representative or successor of Muhammad, the Messenger of Allah, can be selected only by Allah Himself or by His Messenger, but not by the Muslim umma (community, people). 4. Ali is the most highly qualified person to represent the Messenger of Allah, and there is no one better qualified than him. 5. The most important function of the Head of the Islamic State is to promulgate the Commandments of Allah on this earth. Though Abu Bakr was present on the spot in Mecca, he was not allowed to promulgate Allah's commandments; Ali ibn Abi Talib promulgated them. After 9 A.H; Muslims only were to make the pilgrimage. This proclamation marks the end of idol-worship in Arabia. It was the pleasure of Allah that His favorite slave, Ali ibn Abi Talib, should, by reading His Proclamation, put an end to idolatry in Arabia forever.